E-commerce is driving innovation for companies all along the retail supply chain. From new developments in last-mile delivery to the popularity of regional warehousing, major players in the online retail industry are pushing systemic changes for logistics and fulfillment professionals. By all appearances, Alibaba could be doing for global logistics what Amazon did for regional distribution channels. Alibaba is a Chinese e-commerce wholesaler that directly connects manufacturers with small and large businesses for super low prices. They feature millions of products direct from source, circumventing traditional importers and merchandisers in the process. Want 200 bamboo hair brushes? Done. How about 20,000? Easy. Want fifteen electric flatbed trucks? No problem there either. For shipping and logistics pros, the most important innovation in Alibaba’s model is their direct importation and wholesale delivery. Not only does it bypass traditional merchandising systems, it introduces the small retailer into the container shipping logistics picture in a big way. Considering this leap, it’s no surprise that the world’s biggest container shipping companies are concerned that Alibaba will become a competitor in a matter of years. The Alibaba group announced in September that they will be investing 100 billion yuan (equal to $15.12 billion USD) into global logistics efforts. Alibaba already has a logistics wing in APAC that handles middle-mile and last-mile shipping for their products. One key way that Alibaba — along with other key players like Amazon — is pushing innovation is through process digitalization. Pressure from mega-retailers to implement new technology is expediting adoption among major shipping conglomerates. Maersk, one of the largest global container shippers, is rolling out a digitalization strategy to modernize their operations. In an industry where a lot of business is still done the old-fashioned way (over the phone or in person), the emergence of mega-companies who are driven by algorithmic precision is a bit of a shock. That’s not to say container ships haven’t already seen an explosion of tech investment in recent years. The rising popularity of IoT devices all along the supply chain is making product easier to track, while collecting immense amounts of valuable data in the process. 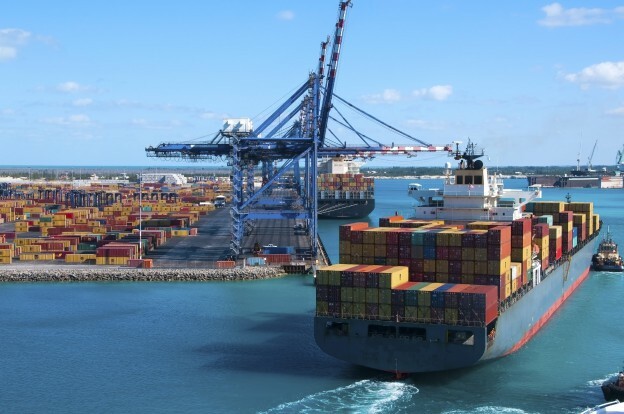 Closer tracking of products through ports and in and out of containers produces immense amounts of data, which is being used to make these processes more efficient. However, it’s certainly newsworthy when direct pressure from one or two companies causes major players like Maersk to accelerate their upgrade efforts. In 2016, Alibaba started leasing containers on ships to facilitate first-mile shipping for third-party merchants on its marketplace. Alibaba wholesale operates in smaller quantities than would typically be purchased by a merchandiser. Individual buyers untethered from larger merchandisers create a lot of small parcels that need to be pushed through traditional bulk-scale shipping methods. For shippers and logistics companies, this means a lot more small packages to ship and track. This is where Alibaba may end up pushing the envelope more than Amazon and Walmart, whose stock is still mostly stored and processed through traditional fulfillment systems for retail distribution. The WMS complexity needed to process thousands of packages from source to container to a customer’s doorstep will be immense — and the ripple effect will likely have far-reaching consequences for global shipping. They suggest that while Alibaba and Amazon will push for tech updates and maybe change per-box rates on vessels, they won’t be investing in a fleet any time soon. Only time will tell if that’s a proper forecast or just wishful thinking. Want to know more about shipping today? Contact us!